How did it get to April already? Since last issue when I announced that we were giving up publishing The Blackwood Times after the June July ‘19 issue we have had many discussions with Blackwoodians who want to see the paper continue productionI want to thankyou all for your input, ideas & offers of support. It has been heart-warming that the Times is seen as such a valuable asset by so many. Chatting with Robina Brown, who started the Blackwood Newsletter, we realised that, between us, we have produced this community information resource for ¼ of a century! At the Progress Associations March meeting David White proposed that “Progress Association would seem the ideal fit as the future custodian of the Blackwood Times. A purpose of a Progress Association is to attract personnel from within a community to ensure continued growth of events, communication and publicity of a region. The Times is one of a number of vehicles to develop this purpose.” Davids presentation was accepted by the committee & since then there have been a number of discussions about how this might work. The current committee is committed to a number of activities & it is proposed that a sub-committee be formed whose responsibility would be to manage & produce the Times. If you would like to be a part of the 3rd generation of our local paper, you are invited to come to a meeting (see notice to right) to discuss how the Times can be managed into the future. Beside the physical paper there are many activities like maintaining the website & social media presence, distribution, writing articles, encouraging others to submit articles, accounting, responding to & collating emails, sorting through submissions, looking after advertisers. We are committed to ensuring a smooth transition & will consult & train as necessary. With Easter just around the corner, I’m looking forward to another fabulous carnival & catching up with everyone before we go into winter hibernation. See you there. 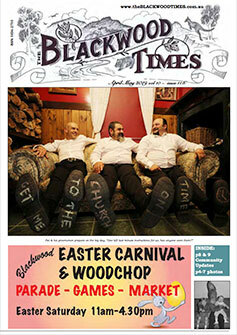 Download the April May 2019 issue of the Blackwood Times here: AprMay’19. With 2 double spreads of photos, who can you spot that you know? Of course all our wonderful contributors articles are scattered through-out the issue. Please consider supporting our future publications by donating when you download … this helps to pay for printing & other costs associated with publishing our Community paper. Please do put a coin or 2 in the box when you take your copy, this helps to pay for printing & other costs associated with publishing our community paper.